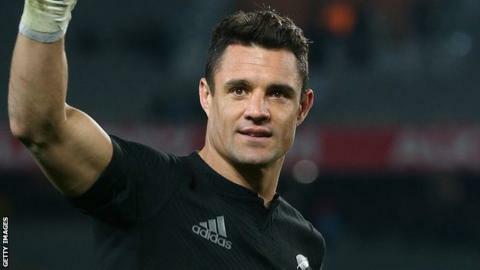 New Zealand fly-half Dan Carter says the pain of missing out on their World Cup win four years ago - and the impending end to his All Black career - are motivating him for this tournament. The 33-year-old, who will leave the international scene when he moves to French side Racing 92 after the tournament, played only two pool games in 2011 before a groin injury struck. "This is the last time that I'll put on the All Black jersey," he said. "I just want to make the most of it." Is English rugby union just for posh kids? Carter was linked with a big-money move to France before he signed a new deal with the New Zealand Rugby Union in 2011 and he says that the chance to represent his country in a fourth World Cup was "a big part of the reason why I signed an extension to my contract four years ago". He added: "I'll do do whatever I can to help this All Blacks side go as far as possible." Carter had to watch from the sidelines as understudies Aaron Cruden, Colin Slade and Stephen Donald combined to fill the fly-half role he vacated, guiding the All Blacks to the World Cup for the first time in 24 years on home soil four years ago. This time, Cruden is ruled out with a knee injury, so Carter is coach Steve Hansen's first-choice fly-half as his team attempt to become the first to retain the trophy. Carter is the leading scorer in international rugby history with 1,516 points, 270 more than England World Cup winner Jonny Wilkinson. His contract with Parisians Racing 92 is worth a reported £790,000 a year.